personal gnosis | O, Mourning Star. . .
You are currently browsing the tag archive for the ‘personal gnosis’ tag. I said, “These human beings are flawed. Murderous.” And for that, God had Michael cast me into Hell. Now tell me: does the punishment fit the crime? Especially when I was right. Look what six billion of you have done to this thing. And how many of you blamed me for it? I swear like four years ago I heard him [Lu] say the exact same thing to me. It’s eerie to hear it all this time later from a tv show. Gives me chills. “That you dare to call yourselves beautiful. You dare to think yourselves gods. All the while, The Above weeps at it’s ruin, and the loss of it’s innocence. As a dying thing, it shudders- it struggles to breathe putrid air. Lately there have been a lot of graphics of roses going up here. In the past I’ve attributed more lavender (and vanilla)-gentle scents-as well as the obvious apple and pumpkin and pomegranate-to Lucifer. As far as florals go, anyway. 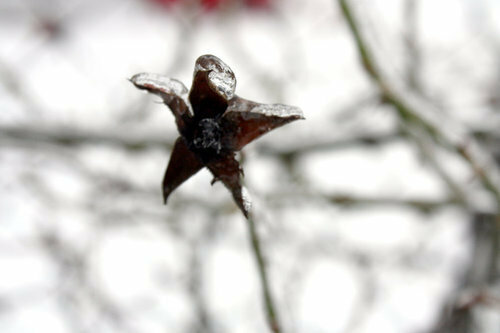 But not long ago I was looking up graphics of roses for a totally unrelated reason and stumbled on a picture of frozen rose hips, which looked like a star. Lucifer’s actual element has always been winter to me; winter, frost, snow. Some fall-ish stuff in there, too, but mostly winter. This probably has a lot to do with how he’s portrayed in Dante’s Inferno. But then I got to talking with another friend of mine, and the story arose between the two of us; that God, loving Lucifer as he did, created the rose to give to his beloved angel. But Lucifer, being of cold and not fire like the other angels, went to touch it, and it froze as he did. Lucifer was so disheartened that God placed a star inside the flower to remind Lucifer that no matter warmth or cold, even in a killing frost, that he was still beautiful to him, and always would be. I loved this idea so much that I decided I plan to incorporate it into my practice; divinely inspired? Who knows, but maybe he’ll love it, too. Lately there have been a lot of graphics of roses going up on my path blog(s). In the past I’ve attributed more lavender (and vanilla) gentle scents-as well as the obvious apple and pumpkin and pomegranate-to Lucifer. As far as florals go, anyway. So here is obviously a subject that I’ve been dancing around for a long, long time. Any time you start talking who’s the ‘good guy’ vs. whose the ‘bad guy’ in any kind of spiritual capacity, you risk offending someone. Which is actually fine for me, because I offend people all the time; but the general gist of what I’m getting at, before I get into the actual subject of this post is, I have my own cosmology under which I operate; and as per the standard disclaimer, I don’t expect it to really hold any water with anyone other than myself. Bonus points if it works for someone else, too; great. Whatever feels true to you? Run with it. But this is my take on the being bearing the name, and his relationship to Lucifer in whatever limited fashion I may or may not understand it. But first a little personal background on the situation. If you’re ready for some steep reading, lets carry on, shall we?